No opponent can ever count Lebron James down - and certainly not out. But in Game Five last night versus Boston, he looked genuinely exhausted. With Lebron generating most of Cleveland's offense and being defended at some point by virtually every Celtic on the floor, physical fatigue may be setting in. As television analyst Mark Jackson stated, "Give credit to the Celtics and the multiple bodies they put on him." Boston's defensive schemes have a lot to do with that. The Celtics won the game last night despite shooting 36.5% from the field. But they played terrific defense and led the Cavaliers in rebounds and steals while turning the ball over eight times to Cleveland's 15 miscues. James had an ordinary game (for him). He totaled 26 points, 10 rebounds and five assists in 39 minutes. When he is on the floor, every play goes through him, whether he shoots, passes or moves the ball. There are few breaks for him. That is where the loss of Kyrie Irving enters the picture. Kyrie's ability to handle the ball, shoot, drive and pass used to give The King some break time, particularly in the intense play of the off-season. James no longer has that type of player on his team. Tyronn Lue: "Yes, I thought he looked a little tired." The defensive scheme (Boston's), when executed as well as it was in Game 5, is not only keeping James' supporting cast in check, it may be wearing him down as well. Without Irving, James' workload is obviously heavier. His usage rate in these playoffs -- he has used 36 percent of the Cavs' possessions (via his shots, turnovers and trips to the line) while he's been on the floor-- is much higher than it was in the last two postseasons (31 percent both years). And it's been highest (37 percent) in the conference finals. 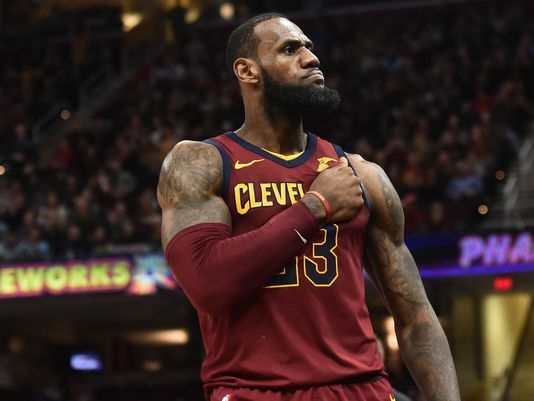 We are on to Game Six in Cleveland tomorrow night, and I certainly would expect to see a bounce-back from James with the home crowd behind him. Even though I don't view LeBron James as Citizen-of-the-Year, I am immensely impressed by his talent, basketball IQ and physical conditioning. But even he has his limits. I hope they have been reached and the Celtics can take Game Six.